We supply a range of articulating adjustable levelling machine mounts or feet with 6mm to 24mm diameter mild steel BZP plated or stainless steel stems with a wide range of stem lengths to choose from. They all are based on a ball and socket design to compensate for uneven area of floors. 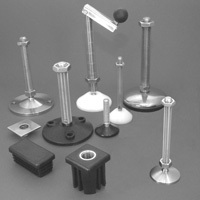 Options of black or white polypropylene plastic base and conical or bolt down type are available. These adjustable levelling feet are a low cost and suitable for conveyors, tables, and fabrications. Some feet come with a option of 316 A4 grade stainless steel. We manufacture all these adjustable levelling feet on site so we can keep standards and the stock levels very high. We specialise in the manufacture of articulating adjustable levelling machine mounts in stainless steel with stem sizes from 8mm to 30mm and will supply a range of stem lengths to order. We also in some cases feet in 316 stailess steel for use within the food processing, Dairy, Pharmaceutical, Chemical, Marine and Medical Industries. They are mainly based on a ball and socket design to compensate for uneven floors, but some are of a fixed type. We manufacture all these adjustable levelling feet on site so we can keep standards and the stock levels very high. These adjustable levelling machine mounts are made from a 3mm stainless steel pressed cover which is injected with nitrile rubber to form a firm base (conforms with USDA standard guidelines). These are less expensive than an all stainless steel foot. Conical or bolt-down options are available. These adjustable feet tilt to 5 degrees and have a machined spanner slot for adjustment. Stem sizes of 10mm, 12mm,16mm, & 20mm are available from stock, whereas larger sizes (24mm, 30mm, 36mm) are made to order. Base sizes from 40mm to 100mm are available from stock, but larger sizes (125mm, 150mm, & 180mm) are made to order. An adjustable foot with an integrated handle for convenient adjustment, which can be folded away when not in use. These are mainly used with castors to stop machinery from moving or shaking, but can also be useful for levelling on mooned floors. They should fit castors from 50mm to 125mm according to length of stem and are available in 12mm, 16mm and 20mm thread diameters. We manufacture all these adjustable levelling feet on site so we can keep standards and the stock levels very high.